I had another story to add about my trip home on Tuesday. In South Station, I heard a woman asking how to get to Porter Square. I turned around and told her that I was heading directly there and she was welcome to follow me. It was cheerful, young Japanese woman who was trying to get home from her first day of work. We negotiated the Charlie Pass thing and got on the train. I was a little surprised that she seemed to be sticking to me like glue. Usually, you help someone to find the right train and that’s it. As we began chatting, I told her why the new card things were called Charlie Passes. If you don’t know, there’s a folk song called ‘Charlie on the MTA’ about this guy who gets on the T and somehow never gets off it. He apparently ends up riding the subway for the rest of his life. She started laughing when she heard this and said to me “I am Charlie! !” Come to find out, this poor girl had left work at Copley, been to Newburyport and back then somehow gotten over to the airport and finally got a bus back to South Station! All this in the process of trying to get back to Acton… and she still had a smile on her face!! I would have been sobbing hysterically on the shoulder of some unfortunate T employee hours earlier! What’s she doing? Laughing to herself while she puts the Charlie Pass in her bag to save and telling me how she’s going to write about her adventures in her journal. You really have to admire people! Anyway, I left her at Porter Commuter Rail with a Fitchburg/Acton schedule in her hand. If I hadn’t had such a splitting headache, I probably would have rented Zipcar at that point and driven her home. Unfortunately, I wasn’t in any shape to drive anyone anywhere. One way or another, I’m fairly confident she got home okay. I finished the green sweater repair! 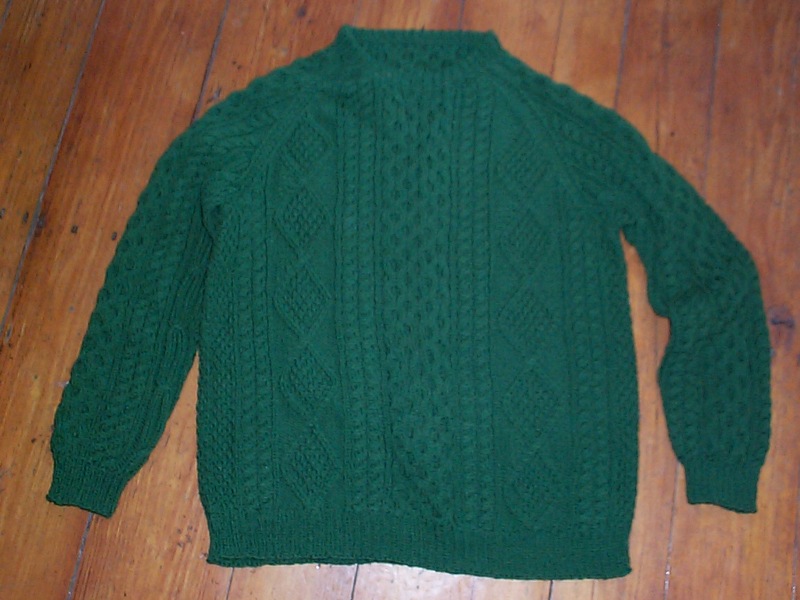 I was considering washing it just to block the new collar and cuffs a bit. I asked the guy how he was washing it and he said he’d never washed it before. I reacted with something really professional like “Eeewww!” and then told him I was going to gave it The Big Washing. It looks (and smells!) much better now. Hopefully, he’ll be by to pick it up today. Also, congratulations to Arianna on the purchase of her first spinning wheel! She bought an Ashford Joy. Have a great time with your new toy, Arianna! Finally, don't forget I'm having my big sale next week. Check my website for all the details! "Olga only takes the "blue line' from "Wonderland" only because she once mistook the sign for "Disneyland". She paid her toll and asked where space mountain was. They told her to get off at the "Airport" station and go to terminal "A" where she promptly boarded flight 433 to Orlando. As she was leaving Orlando she asked for the "blue line'. A suspicious looking man pulled her aside and asked her how much she wished to purchase. She stated that she only wanted one line and the man would'nt sell her such a small amount. A nice man then picked her up and took her to the Amtrak station." NH Sheep & Wool or Noah's Flood with fleece! Spinning Group, UFO and NH Sheep & Wool!